I am grateful for the forecast of 72 degree weather tomorrow! Today it's pretty chilly so that will feel like a heat wave. I love your haikus and your watercolor sketch. So cute! Again a nice post Carol, you were missed. 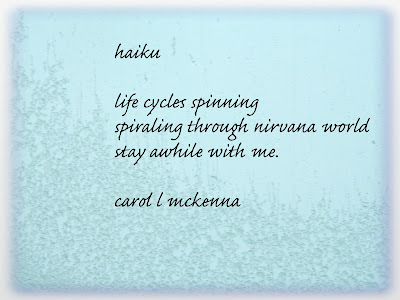 Thank you for this wonderful 'nirvana-haiku'. Your photography is rather special, so pleased to have found you. That nirvana world is sometimes elusive, don't you think? I have proclaimed myself the luckiest man on earth, and have more to be thankful for than I can enumerate. I'll just start with my lovely wife and our 11 smart, beautiful and talented grandchildren. Really like the frosted window. Wow! such pretty shots and inspiring words ending with the sweetest little dog!! You and Artmuse dog have been really busy this week. I especially LOVE your painting of the rabbit and those gorgeous black and white photographs. Blessings! Wonderful photos. 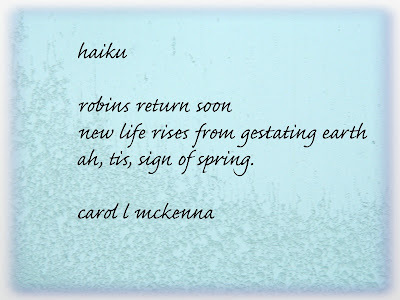 Love the haiku as well. Thanks for joining OYGIF. The bunny is lovely! I am so very grateful this weekend, that our family managed to get my 86 year old Dad into one of South Australia's top nursing homes that specifically catering for, and honour, our country's War Veterans. It's been quite a journey! Beautiful pictures ... I love your haiku, they are so deep !!! My goodness you have been busy and productive. Love Mr. Bunny and what Jack Frost left on your window. Happy PPF ! Your bunny makes me think of spring! I love your rainy photos! So much to love here today. The first painting reminds me of the "Velveteen Rabbit," and the haikus are wonderfully uplifting. The ice photo is absolutely stunning. Dear Carol. truly beautiful and stunning photos. Fantastic effect. Heart warming and wise haiku (which I absolutely love) and extremely cute bunny. Beautiful post. Thank you Carol. Have a great weekend. 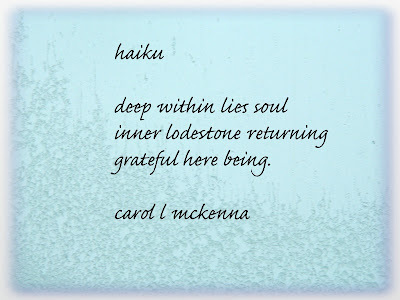 Rain, colored glass, sunrise, haiku... all loveliness is right here in your post! Wonderful! Lovely pics and haiku trio. These are all great photos for the various subjects!! I love each part of this post! Very poetic and delightful! Great bunny painting, Carol. And your photos are beautiful as is your haiku. Your post is so uplifiting, photos , art and lovely haiku! Happy weekend! the snow scenes are soo beautiful but I'm so thankful they're not in my area :)Love your bunny illustration, and your eloquent haikus continue to amaze me. Happy PPF! loved both the pics and haiku! It's always a delight to see what you've offered up to share...I love the diversity! Great pics; awesome series and I especially like the quote because the journey is my reward in writing, writing and more writing! 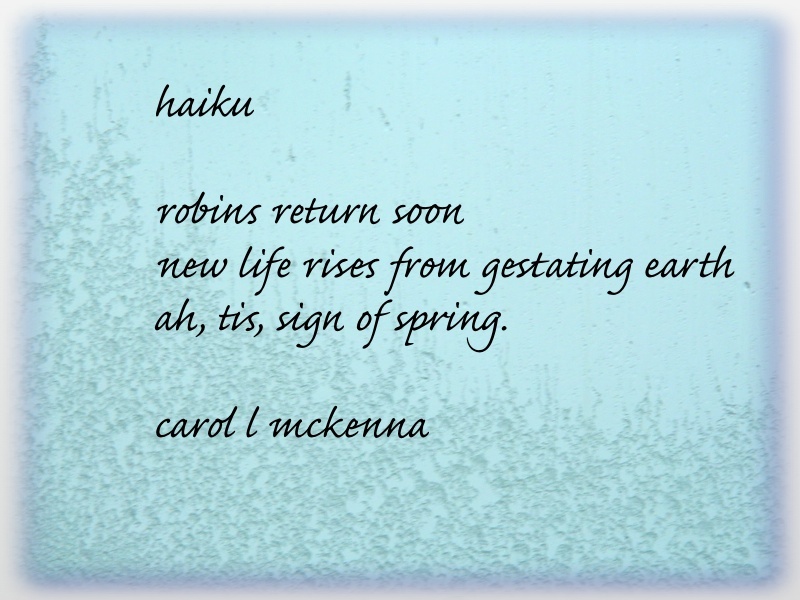 Loving your beautiful rabbit painting and your beautiful Haiku and photos Carol. Such beauty scrolling through today's haiku, photos, and bunny! Love them all. You live amidst such beauty...just outside your window. Carol, I love your Hippity Hoppity painting! Rabbits are such delightful symbols of spring! cute bunny! Aquariann's having a bunny hop you can link to! Amazing work this week! 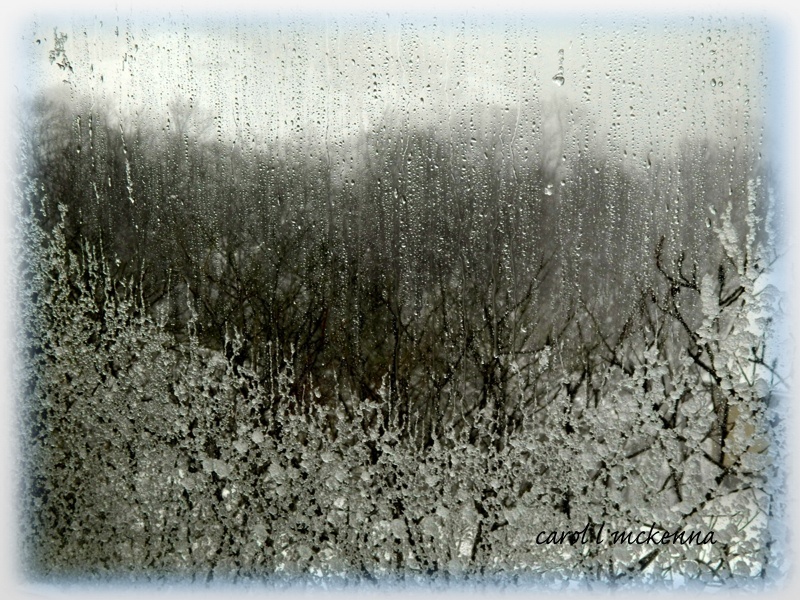 I love the snow on the glass, so cool! Yes! Beatrix Potter style rabbit - I just love it. i really enjoyed all your haiku and your stormy views from home. spring has finally arrived and i am so loving the longer light of day! 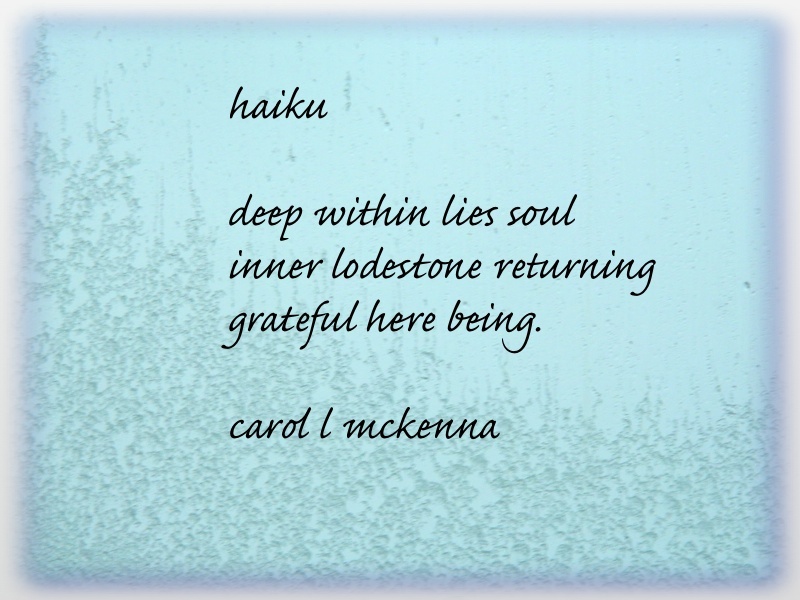 enjoy your weekend carol and thanks for being a beautiful part of haiku my heart. Such a super gorgeous post..your poems are wonderful...your bunny is so beautiful and soulful..love the sheen in his eye..! and your photos are stunning! Love the bead!!! 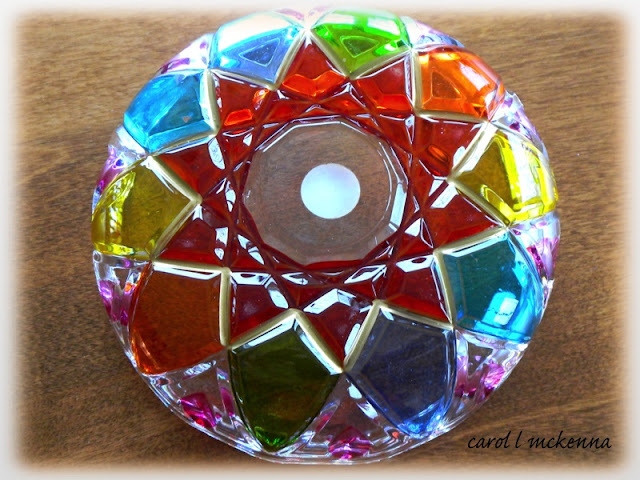 I am grateful for color. Great work, I so love the photos with the ice on the windows, oh and youjr bunny is cute! 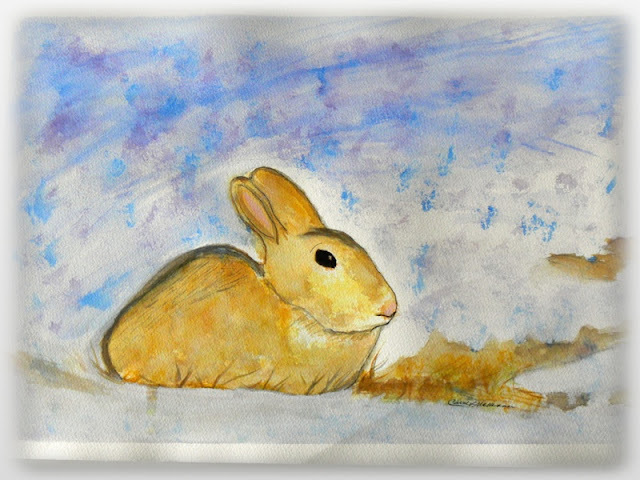 Your bunny painting reminds me of the rabbits that hop around in my garden every morning, much to the delight of my cat, who watches them from the window. Have a lovely weekend! What a lovely work! Love the first photo. Beautiful images! Wonderful sense of atmosphere! And the little rabbit is adorable! But the image that really speaks to me is the last image - like tears raining, like a wistfulness! You sure get a lot in here, so many memes and themes. I especially love the photographs today. Each is its own ambassador for Spring. This rabbit is adorable! Happy PPF! I like the idea of there being an inner lodestone. We all need guidance! What a beautiful post ! Your gratitude is seeping through every detail. I am grateful this day, to live and love and learn. Great shots! I especially love the orange one, and the views out your windows! Oh, that rabbit is so cute. It looks very cold still in your side of the world .... Beautiful photos! You are co creative Carol. I admire such versatility shown here. Beautiful clicks! Hope you'd find time to visit my entry. Cute bunny, jusy in time for Easter. 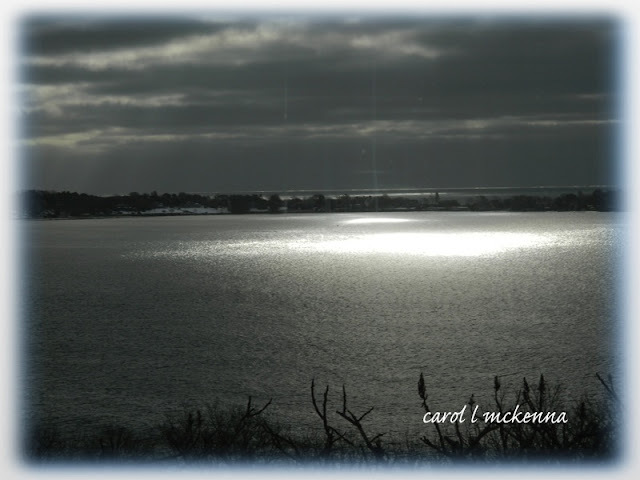 Love the silver light in your sunrise shot. So many lovely photos, Carol, but rain, snow and ice is an unbeatable combination, for sure. Awww, I wuvs bunnies! :) Girl, your photos are wonderful, but I hope you get some warm sunshine soon. Art Muse dog would like to go chase bunnies outside. I can't even choose one, there are so many I like! omigoodness, what a series of surprises, oohs and aahs,a one lifted set of eyebrows. I came for the haikus and fell in love with the Murano glass. When bunnies appear, Easter is in the air :-). Your blog is always one of my favorite stops! Stopping by from Orange You Glad It'd Friday- hope you can stop by. 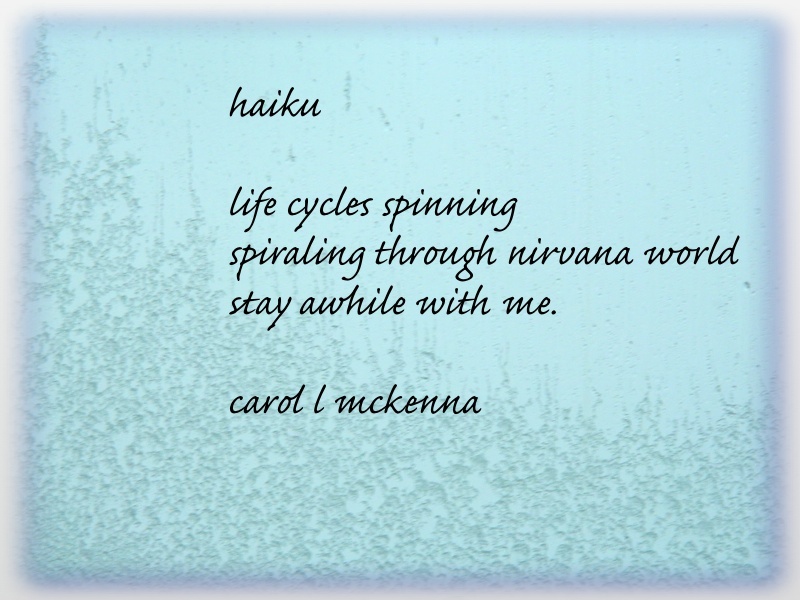 As always, wonderful Haiku - and lovely, intriguing, photography. What sweet bunny! :) Love it! A cold window, but lovely patterns.